FREE FAIR TRADE FRIDAY Giveaway: Win 2 fantastic prizes! We are very excited to announce this giveaway in celebration of Fair Trade Month! This will be a special series of giveaways that will happen every Friday during the month of October, so make sure to check back each week to win! One lucky winner will receive not one, but TWO FREE gifts. First, style, color and function meet in our beautiful handmade Reversible Bag, available in fuchsia rose, plum floral or turquoise. It will serve you well as a purse, grocery tote, school bag, and more! Secondly, you will receive a Reversible Headband that is perfect for a casual daytime look, running errands around town, or a stylish trip to the gym. We will choose our favorite blog comment and that person will be declared the winner. Creativity counts! Entry filed under: Fair Trade, Giveaway. 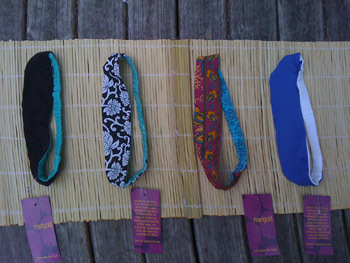 Tags: bag, contest, fair trade, giveaway, headband, Transfair, win. Fair Trade is important to me because it matters to me what someone else feels. I care about my life making theirs’ better, not worse! fairtrade is important to me because I understand how much hard work and care goes into making something and that’s something that needs to be recognized and not taken advantage of. Congratulations! You are the winner! Please send your full name and mailing address to: megan@marigoldfairtradeclothing.com. Thank you for your support of Marigold and fair trade! Fair trade is important so we can leave this world with a little more hope for future generations. Facebook fan. Glad to have found you. Thanks to everyone for your submissions! We will be in touch with the winner soon. Please make sure to enter our next blog contest THIS FRIDAY. Happy Fair Trade month!